When I removed the chain cover (clutch cover) it was extremely hard to get back on because of the middle ring (chain brake band) on the inside of the cover. I've tried everything and can't figure it out? The problem your describing sounds like the chain brake band is engaged on the clutch cover. The clutch cover is the plastic cover that goes over the chain and sprocket area on your Husqvarna chain saw. I believe the chain brake on the cover is engaged which will not allow the chain brake to fit back over the clutch drum. The chain brake band is the round metal ring inside the clutch cover. Once engaged, the ring reduces in size creating a binding effect over the clutch drum which is what stops the chain (safety feature). To test this solution I pushed the front hand guard forward on my own saw while removing the clutch cover. This engaged the chain brake. When I attempted to put the cover back on it would not fit. To fit the cover back on to the saw the chain brake band (metal ring) needs to be disengaged, making the ring bigger so it will slide back over the clutch drum. The chain brake is engaged when the hand guard is pulled back which rotates a small, quarter sized y shaped piece of metal located on the top portion of the clutch cover. It looks kind of like a small propeller. To find this piece, turn the clutch cover over so you can see the chain brake (metal ring) and look towards the top. You should see the small metal y shaped piece I'm talking about. If you turn the metal piece to the right (clockwise) it will disengage the chain brake. I tried to do this with my own saw using a pair of pliers and found the metal piece was very hard to turn due to the tension. To make it easer, align the metal y with the slotted piece on the hand guard. Once the y shaped metal piece is aligned in the hand guard slot, you can pull the hand guard back (towards the handle of the saw) and it will rotate the metal y clockwise, disengaging the chain brake. It's a little tough to do, but I tried it twice with my saw and it worked both times. Just make sure to align both pieces so you don't strip or break anything. Once the chain brake is released you can easily slide the clutch cover back on the saw for reassembly. Use an air compressor to blow away any sawdust and wood debris inside the clutch cover. Sometimes the saw dust will pack in around the chain brake causing it to constrict a little, which could also cause it to bind on the clutch drum. I included the picture to help identify the parts and hopefully make the process a little easier for you. Also make sure to wear a pair of protective gloves during the process. What if the brake isn't engaged, but chain is still getting stuck once the clutch cover is on? I have a slightly different problem. The brake is not engaged (I did that once and it was a pain.) I replaced a chain. Tip sprocket moves freely. Main sprocket moves easy, so does the clutch. Before I replace the side cover (or clutch cover as some have called it), the chain can move freely along the bar. Once I replace the side cover and tighten the chain to a normal tension, the chain barely moves when I pull it by hand. It will give a few inches and then feel really tight or stuck. I only started it twice and the saw stalled out both times within 3 seconds. So what about setting the side cover in place could be getting the chain or else sprockets stuck? I get that the brake makes sense, but it comes off and goes on pretty easy so it doesn't seem like it's engaged...unless it's warped somehow and only sticks every half turn or something?? I'm temped to removed the brake coil just to see if the saw works better. I'd hate to waste torque on some stupid friction problem. As a possible solution I would take an air compressor and blow out all the dirt, sawdust and debris from the clutch cover. A lot of times oiled sawdust will get trapped behind the brake band causing it to be a lot tighter than what it should be, even though it's not engaged. I can't say for sure this is your problem, but in the past I've had it happen a lot to me so I'd say there is a good chance this is what's causing your issue. Another possible issue could be the main sprocket. There are a lot of small pin bearings in the sprocket that could bind when you put tension on the chain. It may spin freely without the tension, but as soon as you tighten the chain, it could cause friction. On my Husqvarna I've replaced the bearings twice. When they started to fail, the chain would bind up and not move freely on the bar. If this isn't the case it's possible the band is warped but I have never personally encountered this problem. Wonderful. It worked for me. I was starting to panick over this problem. I spent almost 1 month trying to figure out what was going on with my chainsaw. Thanks so much, after I tried your instructions it worked amazingly. Thank you so much! I know this blog entry is quite old but I had the situation where I just purchased a new chainsaw (had 1 decades ago). I loosened/removed the bar nut, attempted to remove the cover but it refused to come off. I assumed there was some rubber grommet type thing holding it in place, attempted to remove it more, then resorted to reading the manual (heaven forbid!). There was a step to disengage the chain brake so I attempted to do that...and thinking I did I still struggled to get the cover off. But no fear...just more force and it came off. Well now the dilemma of getting the cover back on. I realized the situation - the band was in the "tight" position. All attempts to open it failed, even attempting to put the cover on and use the handle failed. I did what any person would do - it the internet in search of a solution...and I found it here. With renewed hope I put the cover back on enough to get the handle to engage and snap the brake open. Success!!! Thanks for the tip. Much appreciated. Good post. Helped very much. Thank you. I had it packed up and was headed to the shop as well to have "repaired ". Saved me the trip and money. Wow...I couldn't believe what I was reading. Your post was the first one to come up when I put in sprocket cover replacement. I probably spent 15 minutes 3 different times and was gonna give it one more try before taking it to the shop. Found your post before heading out to the barn and within 10 minutes it was back together and running. Thanks for taking the time to put up your post and saving me the time,money and frustration. Like the other guy said "Ain't the internet great! You are a legend Nick and was so easy to do. I ruined the first cover and it has sat for several years. I ordered a cover (340) from eBay locally for $17 - bargain. It arrived today with brake activated. I googled for how to fit it and your answer was the first one I viewed. Took me one minute to fit! Very helpful post -- I'm back in business! This problem arose -- first time ever -- after my Husky 240 got pinched fast in a tree. In the process of trying to free it up, I removed the retaining nuts and loosened the cover -- with the brake engaged, I now realize (something I would never do on the bench, of course). 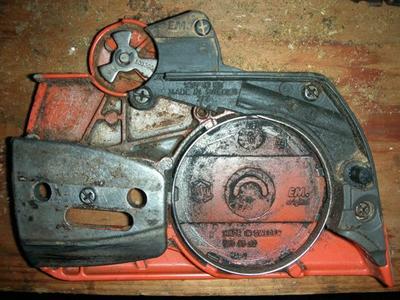 Finally, a rescue cut from a trusty hand saw freed the chainsaw, but then re-assembly became a head-scratching challenge, with the constricted brake band and the two brake sprockets disconnected. Confession: I've never paid that much attention to the brake (which I regard as a well-intentioned nuisance) and thus never thought much about the mechanics, or that the parts could get out of sync in this way. Actually, I've only just pieced the whole scenario together, with your help. So, many thanks for the info... Ain't the internet GREAT!? Husqvarna 345 - That Did It! Like many of the commenters, I "futsed" for a while attempting to open up the spring. Damn it, if I'm having this problem, others may be too. Sure enough, your instructions got me back to fellin' trees. As you say, it takes a little bit of playing to engage the brake-bar cams just right, but then bingo, cover back on. It may not be clear from your instructions, but you have to at least partially mount the cover to engage the cams. Thank you for posting this. I wish I had read this before I spent about 2 hours trying to force the the clutch back on. After I read your recommendation I had my chain saw back together in about 5 minutes. Thank you once again. I'm super frustrated with my Husqvarna 240 as I'm facing the same chain brake issue. I have already broken one chain brake handle and not the y shaped metal piece. I have followed this suggestion and many others I could find on youtube and still no luck. Why they would make this so hard to do is beyond me. Thank you for your fix. I googled the same problem and your response came up and fixed my issue. Excellent fix and thank you for your expertise. How can I replace this band? I have the same problem on my 345. I've spent hours puttsin with that darn safety break. The last time the heavy load spring got away from me and went flying. I didn't bother looking for it. I put all the rest of the parts back on where they belong and consider it an improvement. I know it's a safety feature and I'm all for safety but on a saw that small I'm not to worried about kickback. My other Huskys have a better setup, and being over 5hp I wouldn't chance running them without that break. If I come across that spring I'll have to give Nick's suggestions a try.